AT&T famously ran an ad campaign asking, “How many bars do you have?” It’s been a few years, but perhaps you remember the Ads. The implication of course was that the more bars you have, the stronger your phone signal was. And that would mean clearer phone calls and faster data speeds. Your SEO signal affects your website, particularly with Local SEO. 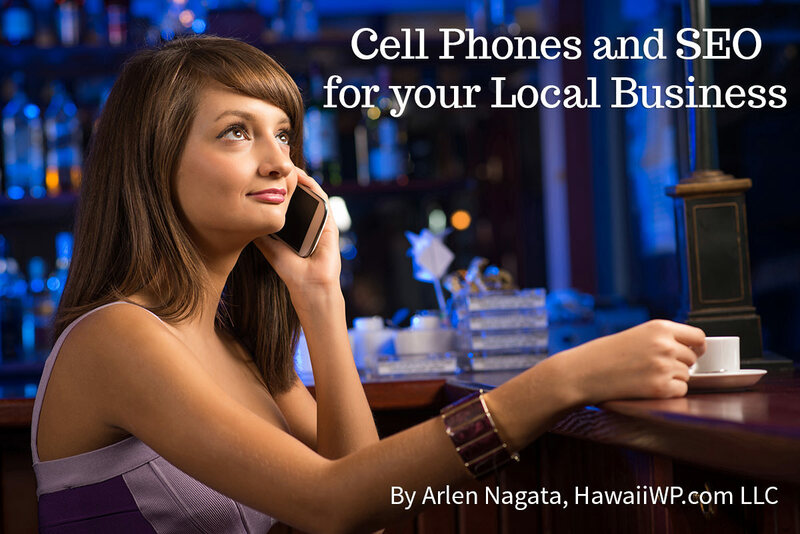 Local SEO (Search Engine Optimization) functions very much like your Cell Phone. The more signal bars you have, the stronger your Local SEO signal will be. And the stronger your Local SEO, the better your Search Rankings will be and the more customers and sales you will make. But you may be wondering, what exactly is Local SEO and Local Search. What is Local SEO and Local Search? Local Search is anytime a person searches on a search engine like Google with a local keyword like “honolulu”. People often search for businesses in this way. For Example: “best attorney honolulu”. Google also infers when people want to search for things near their location (and as creepy as it sounds, Google does know where you are in general based on cell phone towers and internet IP addresses). So if I search for “cake bakery” Google infers that I want a bakery close by and will give me search results of local businesses nearby. Local SEO is the process we go through to optimize our website to get the best search results in Google. As a business owner, you can see how powerful Local SEO is for your sales. Before we talk about getting “more bars” or a better local search signal for our businesses, Let me explain by first talking about regular SEO on every page of your website, then we will talk specifically about Local SEO. On every page of your website, we can rate our On-Page SEO. I like to think of each element in On-Page SEO as a signal to Google regarding your content. Here’s how it works. You want the primary pages and blog articles on your website to target a specific keyword or keyphrase. If you don’t know what keywords to target, you can use Google Trends or try this new website: http://keywordtool.io/ This is a great place to get ideas on what keyphrases to target for your business blog and cornerstone content pages. A good key phrase for my website might be “WordPress SEO Plugin”. If I want this particular web page to appear on the first page of Google search results then I want to make sure I’m sending google that message loud and clear. I need to send Google a strong signal that this is what my web page is about. 1 bar- Is the Keyphrase used in the Title of the article (for geeks, this is your H1 tag). 1 bar- Is the Keyphrase used in the Section Headings of the page (these are the H2 and H3 tags). 1 bar- Is the Keyphrase used a number of times throughout the content of the page. Perhaps 2-3% of the 500 word page contents should be the Keyphrase or a synonym of the Keyphrase. Excerpt (156 characters)- After testing the Top 5 WordPress SEO Plugins in 2015, one plugin ruled them all. This plugin has gotten 3 of our recent clients onto Page 1 of Google. This gives us 5 bars, and as we all know from our cell phones, 5 bars is an excellent signal. If we actually considered our SEO signal strength for this article on our website, we would be sending Google a very strong signal that this article should be highly ranked for the keyphrase “WordPress SEO Plugins”. Of course there are many other factors in SEO including how many other websites are competing for this same target phrase, so it will take more than one article to rank on Google for this one phrase. We understand regular on-page SEO and the analogy of giving Google more signals but what can we do to optimize our Local SEO? Here are a few Local SEO signals to optimize. The Meta Title is not something we normally notice when viewing a web page. “Meta” refers to a tag in the code of the website, but one that is not readily visible to people. The one place you will see the Meta Title is at the top of your web browser. In Safari on the Mac, you’ll see my Meta Title in the image below. Again, this description will not be visible on a web page. But where you will see it is when you do a Google Search. 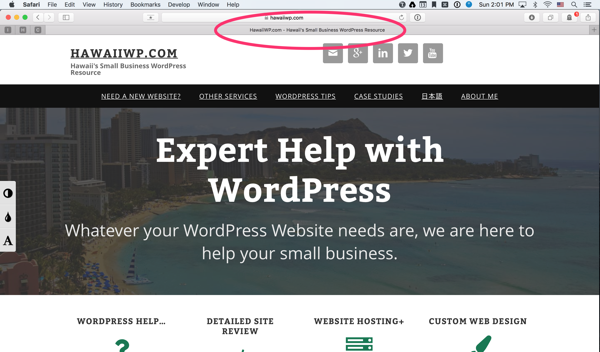 When I just did a search for “hawaii wordpress” in Google, amazingly my website is the first result. (cheering noises) The sentence or two you see under the name of my website is the meta description. Some SEO experts say that these Meta Items don’t influence Google search ranking algorithms. This is probably true, however they will help people find what they are looking for in Google Searches so they are valuable signals to send to Google. Twitter and Facebook have some proprietary code that will help your website display better when shared on those social networks. If you are actively promoting your business on either or both of those networks, it would be good to optimize those tags as well. Certain pieces of information are great to put in your website footer. While you may not be able to fit all of this information, picking 2-3 of these to feature will go a long way for your business. This is where I like to put the Schema Tags for Location Data because this information will then appear on every page of the website. People search for information about businesses in many different places. Here are some of the best places to put your business listing. If you want to automate the process of getting listed, we suggest you signup with Moz Local (https://moz.com/local/overview). $84/year is a small investment to get your business listed across the internet in business directories. By giving Google these six Local SEO signals for your business, you can boost your search engine ranking above your competitors in the Search Results. In 2015 I started using these tactics to help a number of local businesses rank on “Page 1” in Google Local Searches. For at least three of these businesses, their ranking rose to position 1-3 for their targeted search terms. I cannot guarantee that you will have similar results, but I can guarantee that this is a growing area in SEO and right now this is a great way to give your business an edge in Search Rankings. So what are you waiting for? boost your Local SEO signal by optimizing these 6 areas and watch your business rise in the search results.